The Great Smoky Mountains National Park’s Mountain Farm Museum is a re-creation of the many household gardens that were once common throughout the Smoky Mountains. 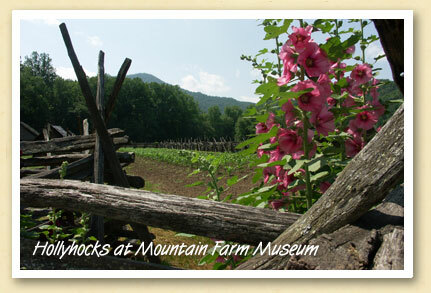 Located near the Cherokee entrance to the Park, the living museum accurately demonstrates the farming methods and crops of the nineteenth century, including the hollyhocks that were often grown along the split-rail fence lines. Photo by Jennifer Wilson.